Try this powerful and effective home remedy for Candida Yeast control with Ceylon Cinnamon powder, sticks and the Bark Oil. We look at the research, recipes and how you can take it to eliminate an excessive Candida over population. Most people have Candida. In that sense it is not a disease, merely an over population. Ceylon Cinnamon is well placed to manage this out of control situation caused by the modern American diet. Do you have symptoms of Candida? Like Thrush, Acne, brain fog, cradle cap, diaper rash, eczema, toenail fungus, diabetes, heartburn, joint pain, migraines, psoriasis, respiratory problems and sinus congestion. Perhaps a Candida related Urinary Tract infection? Or those unsightly red patches on your neck, arms or in between fingernails and toes. Worry no more. 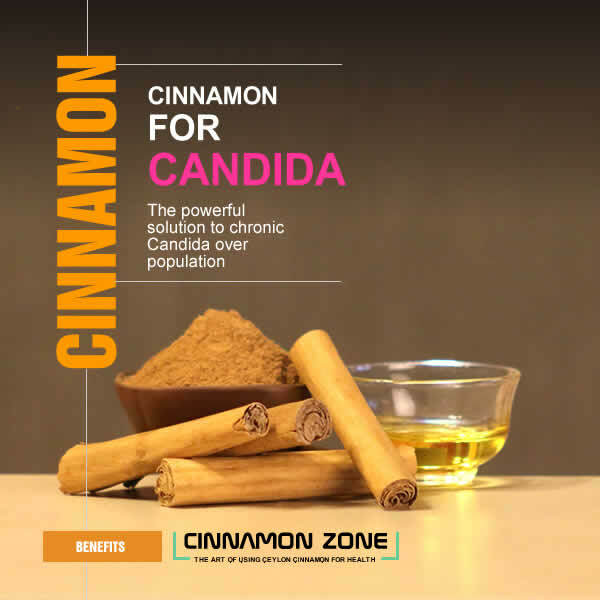 Ceylon Cinnamon is probably the best natural and most effective treatment for virtually all types of Candida yeast infections. A number of studies show that Cinnamon Oil is one of the most effective treatment options for Candida infections. And here is why. This German study discovered that Cinnamon Oil was one of three leading essential oils effective against two strains of Candida, C. orthopsilosis and C. parapsilosis. A second study from Brazil found that Ceylon Cinnamon Oil Bark Oil was effective against three strains of Candida. These are , C. Orthopsilosis and Candida Parapsilosis and Candida Krusei. The major components of Ceylon Cinnamon bark was Cinnamaldehyde and caryophyllene. This study from China found Cinnamon Oil was effective against three strains of Candida which were Candida albicans, Candida tropicalis, and Candida krusei. What is impressive is that Cinnamon Oil is effective against anti-biotic resistant Candida which has become a serious problem at hospitals around the world. All indications are that Candida thrives in a sugar rich environment. Other evidence shows that Cinnamon is fairly effective at controlling your blood sugar levels. Meaning if you can control your sugar levels with the aid of cinnamon, then chances are your Candida issue may also be reduced significantly. This abstract presents fairly compelling evidence that anti-Candida properties of black tea polyphenols that may find therapeutic applications in the future. Drinking a cup of Ceylon Black Tea infused with real cinnamon bark oil might be an effective Candida fighter. And possibly far more effective than any other remedy. If you are a diabetic, chances are strong that you also have a Candida infection. This is because in diabetes patients, the blood sugar control mechanism has broken down; creating a sugar rich environment that Candida thrives upon. In fact having Candida is a good predictor of diabetes. And if your Candida yeast infection subsides it might be an indicator that your blood sugar levels might be under control. There are over 70 different types of Candida. The strains that cause the most trouble is C. Albicans, living in the mouth and gut of 80 per cent of all people. Usually it is not a problem but if overpopulated, it can cause severe problems for the young, the elderly and those with compromised immune systems especially those undergoing chemotherapy, surgery or organ transplantation. Another dangerous strain is Candida Krusei which is used in Chocolate production. Usually the symptoms manifest themselves as a yeast infection in the genital areas ((thrush, Urinary Tract Infections), on the mouth and respiratory areas of the body. Sometimes it manifests itself as red patches on the arm, neck and chest areas. Toenail fungus and Athlete’s foot is another symptomatic indicator. Candida is most dangerous in the stomach where it will break down the barrier between the stomach lining and blood vessels creating massive stomach pain. Most outward symptoms of Candida originates in the stomach due to this process. It can also manifest itself as Acne, brain fog, cradle cap, diaper rash, eczema, fungal nail infections, heartburn, joint pain, migraines, psoriasis, respiratory problems and sinus congestion. Weakened Immune system - This is probably because you have a weakened immune system. If you love your sugar, especially chocolates or Soda, you probably created a sugar rich environment in your body that Candida thrives on. Anti-biotic overuse - Many people contract a Candida infection during hospital stays because anti-biotic treatments often destroys all good bacteria in their system. To add insult to injury, Candida has developed a resistance to anti-biotic treatment. This is why many say antibiotics are the worst treatment option to treat a Candida infection. Processed food - Our modern lifestyle has led to eating too much processed foods. Many products are genetically modified with unknown consequences. We also feel excessive dairy consumption which is a leading cause of a huge range of ailments contributes to Candida. Supplements - Many supplements have things like Maltodextrin (to make it slightly sweet), cellulase, fructose, glucose, sucrose and even alcohol which leads to a Candida over population. Avoid all supplements and each natural food is our advise. If you are considering Cinnamon as a Candida fighting strategy, then switch to Ceylon Cinnamon which has ultra low levels (0.02%) of Coumarin. Regular Cinnamon or Cassia Cinnamon as it is often called has high (0.4-08%) levels of Coumarin, a substance known to cause liver damage or complete failure if taken on a daily basis for extended periods of time. Ceylon Cinnamon can be safely taken for extended periods of time. In either case, you should take a week’s break every six weeks to prevent general toxicity. The recommended dosage of Cinnamon according to the US Department of health, is 6 grams (powder) daily for 6 weeks or less. Ceylon Cinnamon Sticks – Boil one Cinnamon stick, add a teaspoon of lime and drink. This method is called Te de Canela in Mexico and it is delicious. Ceylon Cinnamon is naturally a little sweet and when you add a teaspoon of lime it makes it slightly sweeter so there is absolutely no need to add sugar. It won't be sugar sweet but it is quite pleasant tasting and you will be struck by the wonderful aroma. Cinnamon Powder - While the essential oils in Cinnamon powder has about 1/3 the volatile oils to that of cinnamon sticks (3.5% usually), it may yet present a good option if you get tired of drinking Cinnamon. Simply adding it into your daily diet might be an idea. Ceylon Cinnamon Bark Oil - If you got a really stubborn case of Candida add 1-2 drops of Ceylon Cinnamon Bark Oil to an 8oz hot beverage (Avoid coffee or hot Chocolate). It mixes particularly well with black tea. Of high quality large leaf Ceylon Tea is the best. This is the nuclear option. Remember the Bark Oil is hot, spicy and sweet tasting (does not contain sugar). Be careful when you mix it. No more than 1-2 drops per 8oz of liquid if ingesting. For topical applications (except genital areas and mucous membranes) adding 1% Ceylon Cinnamon Bark Oil to a carrier Oil (Coconut Oil, Olive Oil, or Baby Oil etc.) could be an effective treatment option. Be careful how you mix it and keep it away from eyes, genital areas and mouth. Undiluted Cinnamon Oil is extremely hot and spicy. Eliminate or reduce your consumption of sugar, honey and especially chocolates many of which uses yeast in their production process. Avoid baked goods, especially those that use yeast in their production. Cut out all dairy products. A low carb diet - Avoid pasta and switch to rice or high fiber rice like red rice. Eat fresh low sugar vegetables like Broccoli. Avoid antibiotics and any supplements unless they are physician recommended for a short duration. Drink a cup of Ceylon Cinnamon Tea. Think about incorporating Ceylon Cinnamon into your diet with our lovely selection of Ceylon Cinnamon recipes. Instead of expensive probiotics eat some pickles once a week to introduce good bacteria to your stomach. One Month - Anecdotal evidence seems to suggest that you must follow a Candida treatment regimen a month for every year you have had Candida. That means if you have had Candida for 2 years, you need 2 months of treatment. Whether it works for you will depend on how disciplined you are. Change Diet - Just drinking Cinnamon Tea without even making an attempt at a Candida diet, obviously will prolong the recovery process. Yes, the Candida diet is often extremely restrictive, perhaps too restrictive and can be misleading. Perhaps you can start off with cutting out or dramatically reducing the obvious and easy things that make Candida really bad. Like sweets, especially chocolates. And baked goods full of yeast. Switch to rice from Pasta and cut down on the over consumption of dairy products like Milk, Yogurt, Cheese. Dairy has no place in your diet anyway. American dairy is pretty bad. Eat fresh vegetables. The research shows Cinnamon is extremely effective against Candida. All the evidence points to Cinnamon as being more effective than any other Candida treatment option. It’s practical, cost effective and easy to take. Most people like cinnamon. Ceylon Cinnamon tastes very mild, is slightly sweeter and has a more complex flavor. Incorporating it into your diet is very easy. Look at the some of the amazing Cinnamon stick recipes from Sri Lanka. Mix it up with other spices like Turmeric, garlic, ginger, cloves which can go a long way towards improving your gut health and get rid of the dreaded Candida.